Swatik (SWAH-TICK) captured his first three domestic titles in 1999 with Mike Whitmarsh at Hermosa Beach, Belmar and Manhattan Beach. 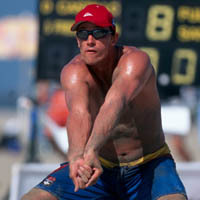 Swatik ended his best pro season in 1999 by capturing the �King of the Beach� competition in Las Vegas. He made his pro beach debut in 1992 while he was attending UCLA where he graduated in 1993 with a degree in Geography and Environmental Studies. He enjoys playing basketball, golf and surfing in his spare time.